Are you considering offering in-store pickup? Consumers are interested. Make sure your employees are properly trained in cyber security. And check out the free posters from Halock Security labs. Are you considering offering your products to shoppers in other countries? eMarketer explains the who, where, how, and why of cross-border shopping trends. Is your profitability suffering because your operations are not efficient? This article may explain why. Motivate shoppers to use your website for researching your products and make it easy to buy from you by providing what they need. Embrace your Comparison Shoppers to build confidence, trust, and interact with them. Some shoppers research in stores, where they can touch and feel products, and then buy online at the best price they can find. This type of shopping challenges stores to find ways to capture sales before they walk out the door. They have to discover what motivates their customers to buy in-store, sign up for a store loyalty program, and interact with the store on Facebook. Could it be instant gratification and no shipping costs? Return policies? Shoppers also research online and buy in stores, and online businesses need that same information. What motivates customers to buy online, sign up for a loyalty program, and interact with your business on Facebook? Researching and comparison shopping is as common online as it is in a store, and all businesses need to make sure they’re doing all they can to keep their customers and attract new shoppers. Do your customers research online and buy in the store, or do they research in the store and buy online? How do you capture their sales? If you process payments for credit cards or PayPal, you may be aware that the Payment Card Industry Security Standards Council (PCI SSC) announced last year that payment applications must transition from SSL and early TLS versions to newer and more secure TLS versions by June 2016. While the PCI SSC has more recently extended the migration completion date to June 2018 (http://blog.pcisecuritystandards.org/migrating-from-ssl-and-early-tls), some (not all) individual gateways are still proceeding with plans to disable all versions of SSL and early TLS versions before this date. Among these individual gateways, PayPal has recently announced that they will “move forward in implementing these security standards this year” (June 2016) despite the PCI SSC extension (https://www.paypal-knowledge.com/infocenter/index?page=content&widgetview=true&id=FAQ1914&viewlocale=en_US). Also, Paymentech previously announced plans to transition to only newer versions of TLS in June 2016 and has recently announced an extension only to December 2016. It’s almost spring! Ducks will soon be chasing after their chicks and keeping them in line. In preparation for the day their eggs start hatching, they will be finding a safe place for them, building a nest, protecting it. They will be organized and efficient. Just like those ducks that keep everything InOrder, you work hard for your business, protecting it and growing it to its full potential. You make sure you have a safe place to do business, quality products, and experienced customer service to build your reputation. To keep the momentum, it’s beneficial for any long-time software users to evaluate how they’re using their software and determine whether improvements can be made in their processes. Your business is constantly evolving and improving, and your processes and ERP system must improve with your business. Spring is a great time for this – the holiday rush is over and it’s time to prepare for improvements before the next holiday. Here are some things to consider as you evaluate your ERP system. Is your staff doing manual tasks that can be automated? With the right ERP system, you can automate tasks such as providing shipping and delivery estimates, recovering abandoned carts to increase your revenue, prompting customers to visit your website using your packing slips and receipts, or avoiding backorders resulting from high volume customers. Are you getting the most out of your web cart? How fast can customers find your products? Your ERP system must be committed to helping you improve the shopping experience you deliver, while lowering costs and increasing sales. Customers want to quickly find what they want, track shipments with real-time order status, and personally manage their account information. 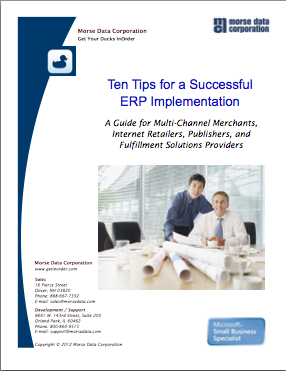 Are you using your ERP system to its fullest advantage? Equally as important as having the best technology is knowing what it can do for your business, and using it to continuously improve your workflows. Have your employees reverted to old processes? Adequate training means the knowledge and support of your system is in the hands of qualified users. When it’s time to re-evaluate your ERP system, give us a call. Morse Data is committed to Change Management and Continuous Process Improvement. Changes can get out of line, but we can help get your ducks InOrder.